Skip Schuyler is an agent with the U.S. Army Intelligence. He apparently has been an operative for some time as evidenced by an old friend (character Ian Murray - see the general information in the Comic Section) describing Schuyler to his new wife as the "ace man in the U.S. Intelligence Service. He's cracked more spy rings than the rest of the department put together." How Murray knew that having been overseas for the last few years is unknown. For all his obvious abilities in the cloak and dagger world, he is still just a lieutenant. It could be he is so good his bosses do not want to promote him for fear of losing him or he could be turning down promotions to stay in the field. Neither is very likely. We know very little about the young officer for he is definitely not that old despite the plaudits about his achievements. He is decidedly tenacious and he is certainly resourceful. He needs to bug a room of an enemy agent before such easedropping devices were invented so he hides a dictaphone behind a radiator. It captures two spies discussing their plans and he is ready to pounce. Athletic, which is not surprising considering his profession. He had had aspirations for a life in professional sports after his stint in the Service but during his West Point days he was involved in a yearly Army-Navy football game when he threw a block that allowed the winning touchdown but also wrenched his shoulder so bad there was no hope of a career. So he stayed with the military and made a pretty good life there. Physically, Schuyler is slightly above average height, good physique, handsome with blond hair brushed back in a subdued pompadour. He is good in a fist fight and not bad with a pistol. He can also fly several types of aircraft with great skill. 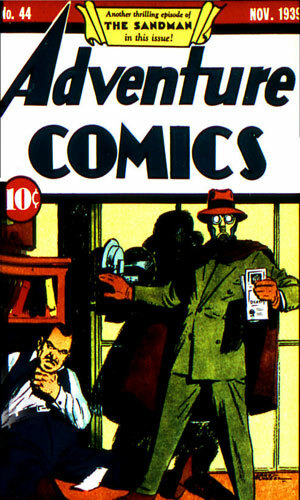 National Publications, soon to be D.C. Comics, opened production of what would be known as Adventure Comics in December of 1935. 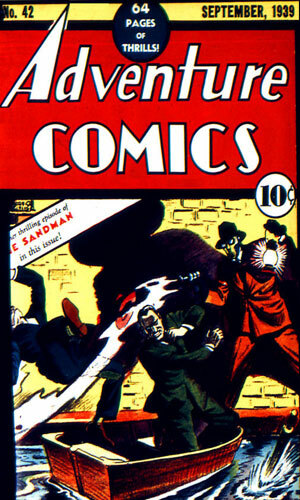 For the first 11 issues it was titled New Comics. 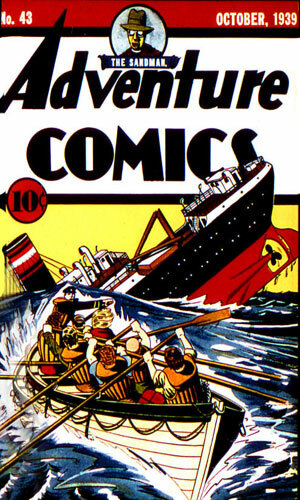 January 1937 saw the name changed to New Adventure Comics and stay as that for the next 20 issues. 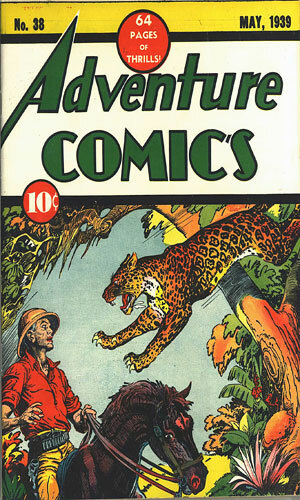 Its name changed again to Adventure Comics with issue #32 in November 1938. The magazine ran continuously for almost a half century before the release of the last issue of this storied, #503, in September 1983. Of course in comicbook land, nothing is dead forever and a revitalized version returned in 1998 and hung around for quite a while again. For many of the years it was on the newsstands, it was the home for stories about Superboy and later the Legion of Super Heroes but when it got its start, it was quite a bit different. 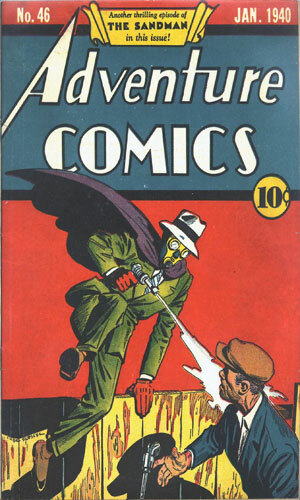 Initially as New Comics it was mostly a humor magazine with a large number of short stories with different characters. There were a fair number of serious titles in it as well but the covers clearly showed it was meant to be a "funny book". 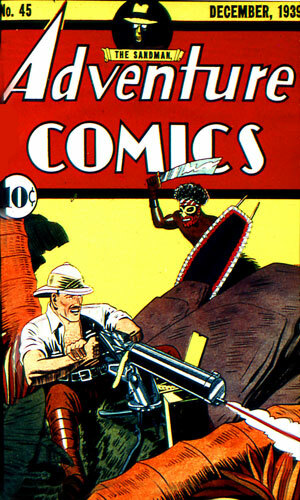 The anthology approach that the mag had, which was the norm for virtually all comic books out there, continued even after it switched to being New Adventure Comics. 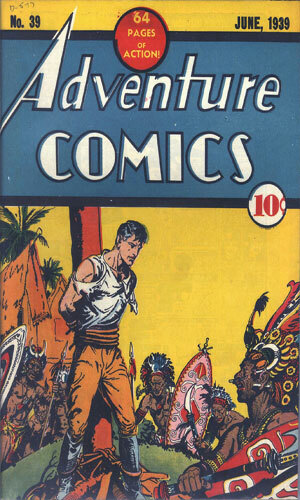 There were less comedic tales in it and the covers would slowly switch to showing stories more attuned to the fact that "Adventure" was now in the title. Did you know that in the pages of this magazine, the alien detective Jor-L was introduced a year before his creators came out with their landmark Superman? (I didn't until I read it in Wikipedia). Back to the topic, well, close to it. One of the "serious" storylines in New Comics was writer-artist Tom Hickey's The Golden Dragon. This comic told the story of three adventurers who got involved in a fair number of hair-raising escapades in the Far East. What happened to them and who they went up against naturally changed from story to story with many tales extending several issues. Leading the trio was Ian Murray, a stalwart fellow who clearly loved danger and excitement. Gradually, Murray took the most active role in the stories but was joined by a supporting character in the eventual love interest, Doris. I mention Murray and Doris because when the Golden Dragon tales came to an end, they were replaced by Tom Hickey's newest creation, Skip Shuyler, ace intelligence officer in the U.S. Army. And how did we get our first introduction to him? He is at a ?train? station on an assignment when he encounters Ian Murray by surprise. They obviously know each other from way back. Murray introduces Doris with whom he just got married earlier that day. After they exchange pleasantries and congratulations, Shuyler head out and Murray tells his wife, in answer to her question, that Shuyler was "the ace man of the U.S. Intelligence Service." Not a bad way to pass the torch. Granted, the torch stayed lit for only ten adventures but what the hey! Note: the titles in quotes are my creation. 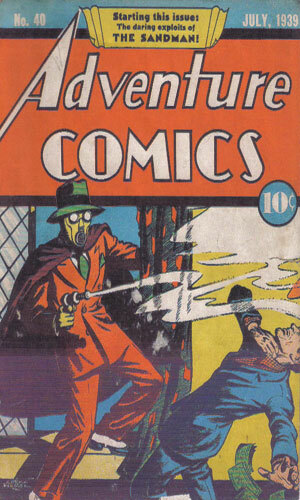 From Adventure Comics #37 - Two foreign agents are in town to steal some classified plans from the government Engineering Department and Skip Schuyler is sent to stop them. 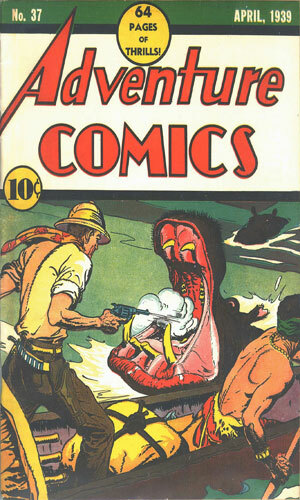 From Adventure Comics #38 - The South American government of Vendazia is in danger of being overthrown by rebels. Skip Shuyler is sent by the War Department to save them, as he put its, "for the American bankers and industrialists". Not sure if he was being serious or sarcastic with that line. From Adventure Comics #39 - Stationed temporarily in a base just outside of Manhattan, Skip Shuyler is pressured by a former West Point pal to pitch in an exhibition game with the world champ New York Yankees. He starring moment was going up against Lou Gehrig. From Adventure Comics #40 - Sent to Hawaii to help an explosives inventor stay safe (?) but ends up helping the man rescue his kidnapped daughter, snatched to force the inventor into handing over his formula. From Adventure Comics #41 - A retired army colonel, friend to Skip Schuyler, has a nice sized ranch but has trouble with rustlers. Schuyler decides to use his talents to being a stop to it. 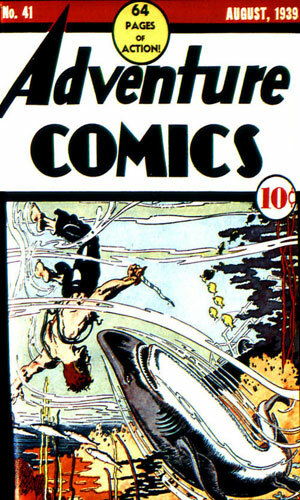 From Adventure Comics #42 - This adventure has Skip Schuyler arriving in China just as enemy planes drop bombs on the city he is in. He saves a small boy from being crushed by a falling wall and together they run across some nasty spies and save a beautiful woman. From Adventure Comics #43 - Skip Schuyler is less than thrilled when he learns a movie crew is coming to shoot some scenes on the base he is at. The beautiful actress Lorraine Brent is one of the stars and does her own stunts but when a speed boat scene goes terribly wrong, Schuyler must perform a stunt of his own. From Adventure Comics #44 - Part 1 of 2. Quite a share of non-PC shows up in this tale of a search by Skip Schuyler and a friend for a fellow pilot who crashed in the Arctic. An Eskimo who liked to indulge his thirst a bit much plays a major role as does a less than sympathetic waitress. From Adventure Comics #45 - Part 2 of 2. Searching on foot in the Arctic wasteland, Skip Schuyler falls through a crevasse and looks for a way out. He finds a very unfriendly Eskimo. From Adventure Comics #46 - In Shanghai on a short assignment, Skip Schuyler meets the lovely Linda Hale at a reception. While he goes to fetch them both a drink, he finds she has been snatched by kidnappers and he goes after them. By his short tenure in the magazine, it was obvious that either the writer/artist or the editor did not think Skip Schuyler had what it took to stick around and I would agree. The stories were alright but Schuyler was exceedingly vanilla in flavor and had nothing to make him stand out. When placed in an anthology like he was, he definitely got lost in the mix. The adventures were fairly subdued compared to the other military intelligence series told at the same time. While his contemporaries were fighting and winning single-handedly one war after another in battlegrounds all over the world, Schuyler's missions were decidedly more realistic (well, he did stop that one war in South America, I'll give him that) and that may have played a big role in his demise. They just might not have been over-the-top enough. At least the final panel in the final story does have him getting a huge thank-you kiss from a rescued damsel. Not a bad way to leave the arena.